Sites of Great Moravia: Slavonic Fortified Settlement at Mikulcice - Church of St.Margaret at Kopcani is part of the Tentative list of Czechia in order to qualify for inclusion in the World Heritage List. I completely agree that Mikulčice archeological park is one of the most important archeo-sites in Czech and Slovak Republics. Empire of Great Morava is of great importance for Czechs, Slovaks and Balkan Slavonic nations, but it has no OUV and should not be WHS. The site is very popular. It is partly due to a propaganda in the Comunist times that everything related with the East that beats the West was greatly supported, and also in midle ages because the emperor Charles IV used the lagacy of Great Moravia archbishopric for justification of independency of church of Bohemia from Germans in 14th century. Furthermore, the testimony of Great Moravia is misused by Slovak nationalists and ultraconservatives. The problem is that Great Moravia lasted only for short period in 9th-10th century, and its heritage is overestimated. I really like the artefacts that were found during long-term excavations such as jewelry. What can be seen in Mikulčice now is only the platforms of 11 churches and several other buildings. Almost no architectonical details were found (only few fragments of crushed frescoes). Several types of churches were excavated showing influences of both West and East: (1) simple one nave church with rectangular apsida, (2) simple one nave church with round apsida, (3) central building with one or more apsidas - rotunda (adriatic influence), (4) three-nave basilica with one apsida. All of them were not very monumental or special as compared to buildings in other parts of Europe. 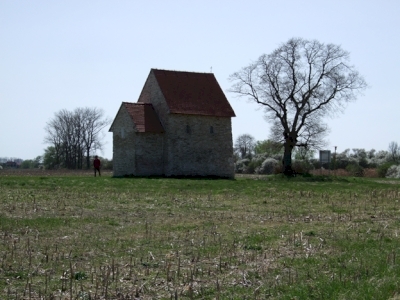 The only still standing church from 27 churches of this period that were excavated is the building in Kopčany (photo), now in Slovakia due to the regulations of river Morava in 19th and 20th century. It is in fact church No 12 of Mikulčice. I think that this building should not be listed as WHS. I have been three times to Mikulčice, the last one during this summer. The archaeological park can be reached from the road n. 55 and there are signboards bringing you through the village to a road which leads 3 km to the south-east and ends at a parking place. First we decided to visit the museum in the first pavilion, which is located in a really horrible communist style building, that, along with a second one (built even above the foundations of a church) and some structures serving as workplace, was constructed in a strongly inappropriate place within the archaeological park. 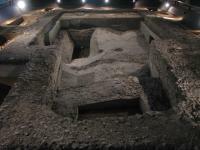 The most interesting finds inside are some wooden ships, located in the middle of the building, and encircled by showcases in which are exhibited arms, religious and quotidian objects, metal pieces of clothes, tools for writing and money. Really noteworthy are the jewels which impressed me also because they are really similar to those of the Lombard civilization of the same period which I had seen in Cividale del Friuli in Italy. After having obtained a map of the archaeological park we reached the second pavilion: this had just been extensively restyled and reopened (I didn't remember how it looked like before but I quite liked the renewed exposition), so we enjoyed the new audiovisual presentation of the most important buildings of the site and the models of these. Once again there are also showcases with objects similar to those in the first pavilion but also examples of the glagolitic alphabet, the oldest Slavic one, introduced here by Saint Ciryl and Saint Methodius from Byzantium. But the most interesting feature of the whole park is located in the middle of this building, the church n. 2, the only one of which the unearthed foundations are still visible. It is a quite big simple one nave building with apse, encircled by 13 tombs (there are 2500 of them underground in all the park) with skeletons in their original place. After that, we enjoyed a pleasant 1,5 km walk in 30 minutes on a pathway through the park, that runs in the middle of sand dunes today covered by meadows and then of alluvial woods and on wooden bridges over ponds near the river Morava (border with Slovakia), where a wetland natural park was created. However it is not particularly attractive, because the foundations of the buildings we saw here are just stone copies on the sand of what is situated underground. It seems that they were excavated and then the archaeologists just covered them once again: it was always a mystery for me why such a stupid method was adopted here (the site now looks exactly as if it hasn't been excavated) and why the buildings were not left visible as in every other archaeological site. However the copies give you a good idea of how 7 churches (one of them is located outside of the itinerary, 200 m to the north of the parking; other 4 were found but their foundations were not reconstructed) looked like. Apart from one they were quite small and had many different plans: one nave with semicircular or rectangular apse or rotundas with single or double apse. There are two buildings really noteworthy: a basilica with three naves, the biggest Great Moravian church ever found, the dimensions of which quite impressed me in comparison to the other much smaller churches, and a palace maybe belonging to the ruling dynasty, with various rooms, the only building of this type discovered in Great Moravia. The last interesting fact is that part of the path runs on an earthen vallum that served as one of the city walls. Mikulčice is the most important archaeological site in Czech Republic and was probably the capital city of the first West Slavonic state of Great Moravia, one of the most important in Europe in the 9th and 10th centuries, which had a fundamental importance for example in the diffusion of culture, Christian religion and glagolitic alphabet, and a territory of great extension that included all Czech Republic, Slovakia and Hungary and parts of Romania, Poland, Austria, Germany, Serbia, Slovenia and Croatia. I think that as for all major civilizations its most representative site deserves to be inscribed on the List. However its authenticity is quite low due to the fact that all its features are situated underground apart from the church n. 2 and the church of Kopčany on the Slovak side so I don't know if this site will be inscribed. See also my review of Kopčany for the Saint Margaret's Church and the adventure connected to that visit.